Among the numerous champions of the Kankakee River I would place Major Samuel L McFadin in the top tier. McFadin was born in Fairfax County, Ohio in 1826. His family moved to Cass County, Indiana in 1839. As a youth he farmed the family property and later apprenticed as a carpenter. McFadin enlisted in the Cass County Volunteers in 1846 at the outbreak of the Mexican War. He talked about his participation at the Battle of Buena Vista and later became a lifelong member of the National Association of Mexican War Veterans. I believe his title of “Major” came about through his leadership in this Association. 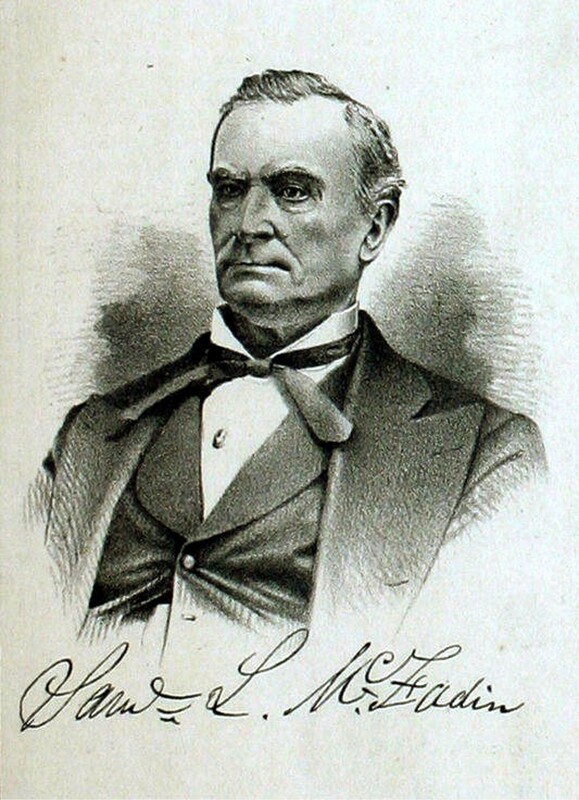 After his return from the Mexican War he began law studies and was admitted to the Cass County Bar in 1851. McFadin went on to have a stellar career having held the positions of prosecuting attorney, judge, county clerk, and Mayor of Logansport. He was known as a congenial fellow and entertaining story teller. It was through his published historical remembrances of pioneer life—specifically his many journeys and adventures to the Kankakee River—that brought him to my attention. The sportsmen from Logansport would travel north to English Lake in Starke County. English Lake was one of the largest lakes in Indiana before it was drained when the Kankakee River was channelized. They would then journey by boat down the Kankakee River to Baum’s Bridge or train to Kouts and then by wagon to Baum’s Bridge. At times the trip was more eventful than the arrival. McFadin wrote that on one trip “Celvert Freeman had got a gallon of 20 cent whisky the evening before while passing Francisville… in the morning there was not a drop of it left…they said it leaked out.” From Baum’s Bridge they would boat to their hunt camps. 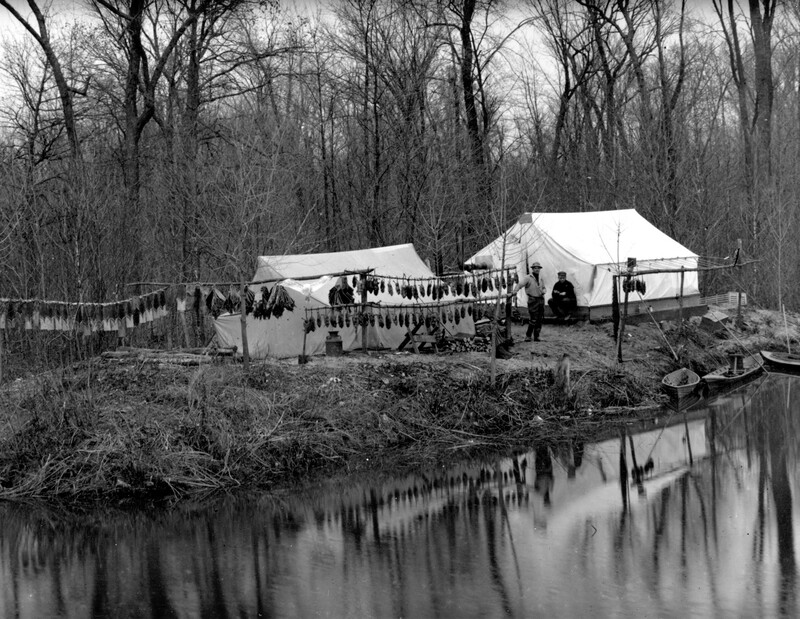 The location of these camps was within ten miles of Baum’s Bridge. I find his vivid and detailed accounts of Kankakee River hunting trips both entertaining and revealing. It especially shows me the difference of hunt camps and hunting of today as opposed to 150 years ago. McFadin’s stories begin with his first Kankakee River trip in 1839 and continue until health problems restricted him in the 1890s. My overall impressions from McFadin’s writings confirm to me hunting during that era was primarily a social event and hunting secondary. His accounts detail the journey to and along the river, camp life, camaraderie and the many incidents, both serious and humorous. He goes into detail about the numerous local trappers, guides and interesting characters of the old Kankakee River.